Bananas are one of the best FIRST FOODS for BABY~ especially when TRAVELING. They’re quick, easy and come in bunches!!! High in POTASSIUM, FIBER and plenty of other vitamins and nutrients, bananas contain ONE OF THE MOST WELL-BALANCED combinations for overall health. The fact that they help to RESTORE ENERGY makes them perfect for ATHLETES, GROWING CHILDREN and YOUNG PUBESCENT ADULTS. A child’s developing brain and active hormones go through processes that require lots of energy and burn many calories. On the other hand, properties in this fruit also calm and soothe, INDUCING REST. Try feeding a banana to your little one an hour or two before bedtime~ watch how relaxed she’ll get! GREEN BANANAS (Unripe) contain lots of STARCH and FIBER. Therefore, they EASE CONSTIPATION. 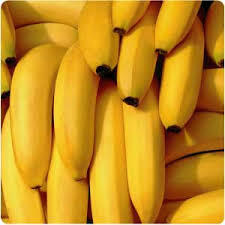 Eating RIPE BANANAS are nutritionally restorative after a bout with DIARRHEA. I ate so many bananas in my childhood that I absolutely WILL NOT eat a yellow banana. I will, however, add them to my smoothies and other recipes.